We were tasked by our client Subway to raise awareness of their partnership with NFL London and sponsorship of NFL Flag football ahead of the 2018 Superbowl. 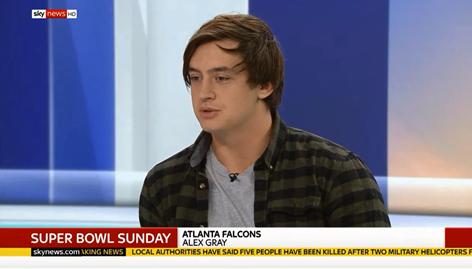 In the week leading up to the big game, we set up broadcast interviews with British American Footballer player and tight end for the Atlanta Falcons, Alex Gray. We were able to incorporate Subway's key messaging around the NFL's Flag football programme into the pre-Superbowl discussions that were taking place across broadcast media that week. TV coverage achieved included prime slots on Sky News Sunrise and BBC Look Nort's evening news programme as well as radio coverage across Sky News Radio, Metro Radio, talkSPORT and regional BBC radio stations.